The Voice of the Philippines Knock Out Rounds continues as each team ventures to have their top six to perform in the Live Shows and still be in the journey towards the ownership of the title of being The Voice. 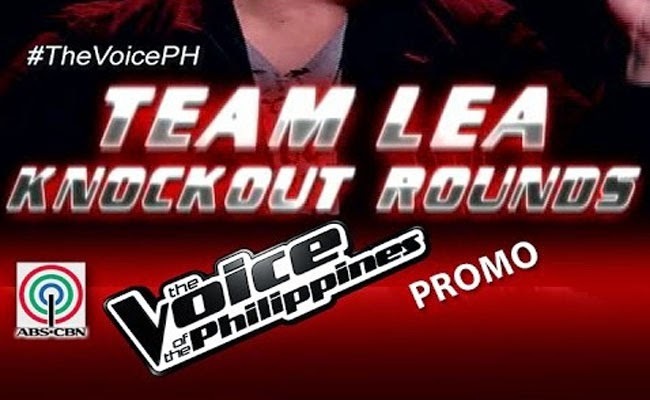 It will be Team Lea’s turn to finally have their Knock Out Rounds on January 11, 2015. Leah Patricio will be singing ‘Bukas Na Lang Kita Mamahalin’, while the four chair turner Nino Alejandro will be performing ‘Love Hurts’. Timmy Pavino will be singing his rendition of ‘Narito’ and Mic Llave will perfom the iconic song ‘Anak’. Jem Cubil will sing ‘Drive’, Charles Catbagan on the other hand chose ‘Kahit Isang Saglit’, and Miro Valera will perform ‘Wannabe’. Stolen by Lea from Team Bamboo, Casper Blancaflor will sing ‘Bring Me To Life’ and former Team Apl member Abbey Pineda will give “Di Na Natuto” her style. The artist personally chose their own songs that they think that will uniquely show their potential and strengths. they will be divided into 3 groups with three members each to face off each other. They will be informed on who they will be with in their group during the Knock Out Rounds. Six will be chosen by Lea to be kept on the competition and move forward towards the live performances.